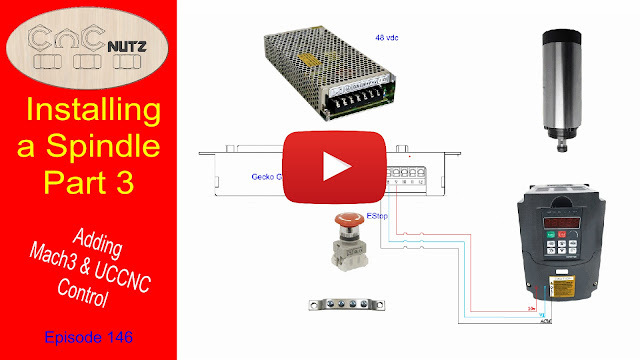 This video will show how I wire a relay to the Gecko G540 to turn the spindle on and off and then follows up how to program both Mach3 and UCCNC to control the relay. Once that is done I show how with just 3 wires you can add speed control from both Mach3 and UCCNC. All the required documentation you need is available for download on this page and they are quite comprehensive. I will not repeat thier contents here. The documentatiion you need to set up both Mach3 and UCNCN are in the 2 files below. Download and follow the instructions and you should have a working system. Please note that the speed will vary from the requested one as there is no feedback from the spindle for UCCNC to verify the actual speed. It should be within a couple of hundred Revs of the required speed. Changing the PWMBase Freq can make a large change to the final RPM but I found 1200 gave acceptable results on my setup. Do not expect perfect speed. Any comments or questions please feel free to contact me either using the comments section here or on YouTube. Feel free to email me if you wish.